Q. Where is UMBC located? A. UMBC has a unique location and academic environment. It is situated on a spacious 480-acre campus only a few minutes from I-95, with easy access to Baltimore and Washington, DC. With about 10,000 students, UMBC combines the advantages of a research university with the intimate atmosphere of a liberal arts college. A recent College Guide issued by U.S. News and World Report ranked UMBC “among the major leagues of American higher education.” According to the Guide, institutions such as UMBC offer “more opportunities for obtaining the ingredients of a good education than do the majority of schools in other categories”. UMBC’s reputation as a first rate medium sized research university that cares for its undergraduates continues to grow every year. Q. How large is the UMBC Physics Department? A. The department is composed of 24 tenure-track faculty and two full-time lecturers and 15 research faculty. There are approximately 120 undergraduate physics majors, distributed over the four years. Twenty-seven percent of our majors and minors are female. In 2008, we awarded 19 BS degrees in physics; our average number of graduates over the past three years is 12. The department also has 50 graduate students in our Physics and Atmospheric Masters and PhD programs. Q. How large are physics classes at UMBC? A. The first two required courses (PHYS 121 and PHYS 122) are large, approaching 250 students in each course each semester. In these two courses, all students attend a common lecture three times a week, but they also are grouped into smaller 50-student sections that meet for a discussion period two hours per week. In addition to physics majors, these two courses are populated with engineering, chemistry, biochemistry and computer science majors. Once past these two courses, physics majors can expect to have 10–25 other students enrolled in the required physics courses. Advanced lab courses such as PHYS 324H and PHYS 331L have maximum enrollments of 10. Q. Are graduate students used to teach undergraduate lecture courses? A. No. The only use our department makes of graduate teaching assistants is to run discussion sections in PHYS 121 and PHYS 122, assist in laboratory courses, grade student assignments and to provide help in the Physics Tutorial Center. Lecture courses are taught by our own full-time faculty; in rare cases, an elective specialty course like astrophysics, atmospheric physics or computational physics might be taught by a part-time faculty member (usually, a current adjunct/research professor). Q. Is it possible to do undergraduate research in physics at UMBC? A. Not only is it possible, but we strongly encourage it! 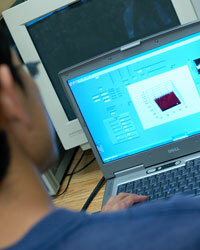 Many students work on individual research projects, in collaboration with faculty members. This can be done as a special topics course for credit (PHYS450 or PHYS499), or as a paid research assistant or intern. The department has several summer internships available for undergraduates who want to do research over a summer, either at UMBC or at NASA Goddard Space Flight Center. The department also offers one student a year a Donald N.Langenberg Undergraduate Research Award to support undergraduate research.